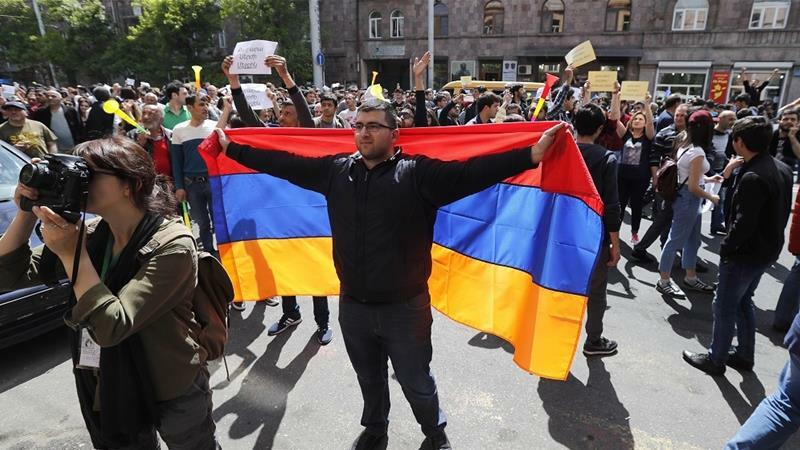 YEREVAN, Armenia – Protests erupted in Armenia after 2 government appointments were announced. Protesters gather in the main square of Yerevan. Photo Courtesy of Artyom Geodakyan. The previous president, Serzh Sarkisian, second term ended on 9 April 2018. Yet, the Parliament elected him Prime Minister just 8 days later, elongating his time in power. The vote was 76 to 17 with no abstentions. Parliament also elected Armen Sarkisian, who Serzh Sarkisian endorsed, as the new President. The protests have been mainly peaceful; however, olice warned that the protests were illegal and that they would be “discontinued.” On 16 April, the demonstrators clashed with the police. Forty-six people were injured, including 6 policemen. On 18 April police detained 87 demonstrators. Only 30 were held on administrative charges such as “holding rallies in violation of the established procedures,” or “participation in mass riots.” The rest were detained as witness in ongoing investigations about the protests. Under Armenian Law, witnesses can be detained for interrogation if they don’t respond to a summons to appear. Additionally, they can only be detained for three hours without be recorded or released. In the case of the arrests made during the protests, many people were held up to 9 hours.